Does the government have an anti-bike bias? 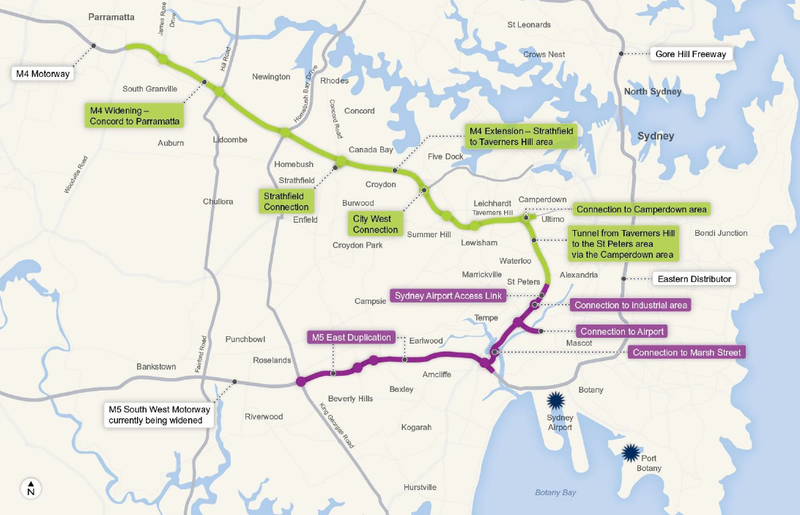 While the state government has put public transport front and centre, with new projects like the North West Rail Link and South East Light Rail Line, its support for bicycles remains less enthused. Even in the 2011 election campaign, then Opposition Leader Barry O’Farrell joked that if Sydney Lord Mayor had been in charge of building the Harbour Bridge then the bike paths would have probably met up, ridiculing what he saw as Ms Moore’s overly keen stance on bike infrastructure. 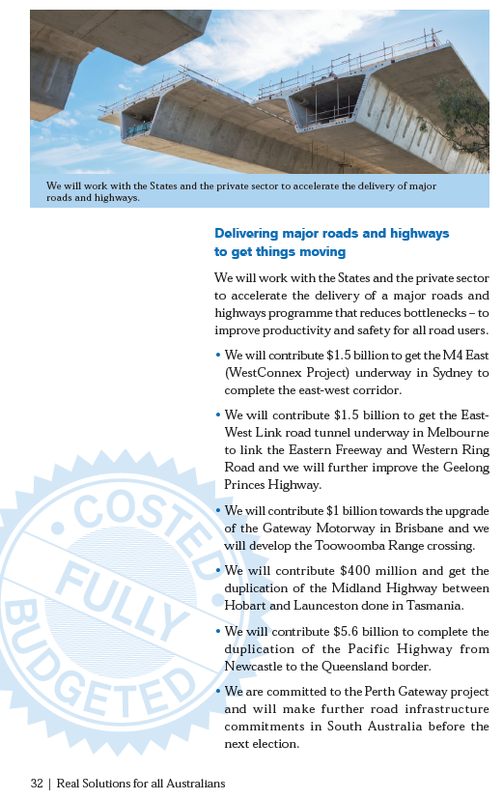 Mr O’Farrell, now the Premier, is backed up by Roads Minister Duncan Gay. 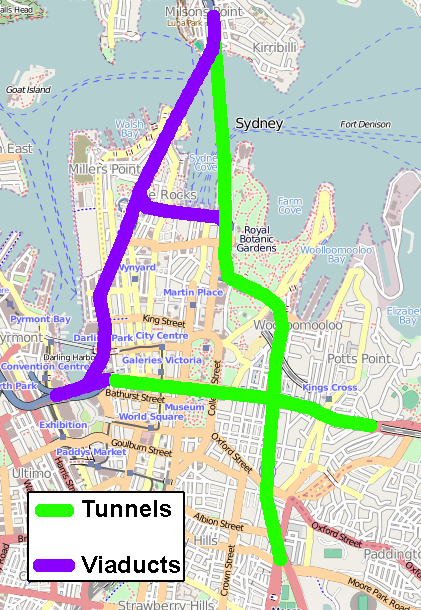 Mr Gay has complained about the College St bike path, despite the fact that the RTA (now RMS) is of the view that College St was a preferred location for a bike path and that no traffic lanes were removed in order to create it (Source: Sydney Morning Herald, 20 August 2012). Mr Gay has also squashed any hope that a potential future bike hire scheme in Sydney could be exempted from the compulsory helmet laws, making it far less likely that such a scheme would succeed. But it’s not just the Roads Minister that has put up obstacles to improving bike access. The Transport Minister Gladys Berejiklian dropped the Greenway, a shared pedestrian and bike path in the Inner West, that was to go alongside the light rail extension to Dulwich Hill. Cost savings no doubt contributed to this decision, but the government’s budget shines a light on its priorities. Indeed, when the minister in the state cabinet who has been a strong advocate of public transport shows little interest in progressing such a project, it shows that this mode of transport has few friends in Macquarie St. So when news emerged recently that the government was considering a new bike path along a pedestrianised George St, it’s difficult to give this the benefit of doubt. 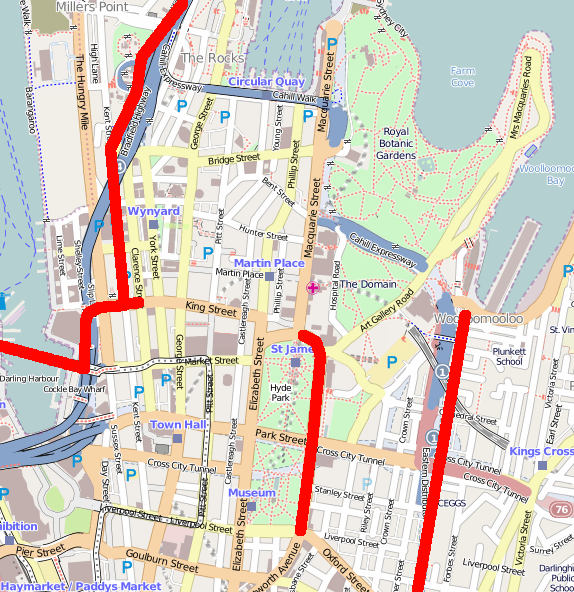 The Central Sydney Traffic and Transport Committee, created by the state government after the 2011 election and required to approve any new bike paths in the CBD, has stalled any new bike paths in the CBD since that date. 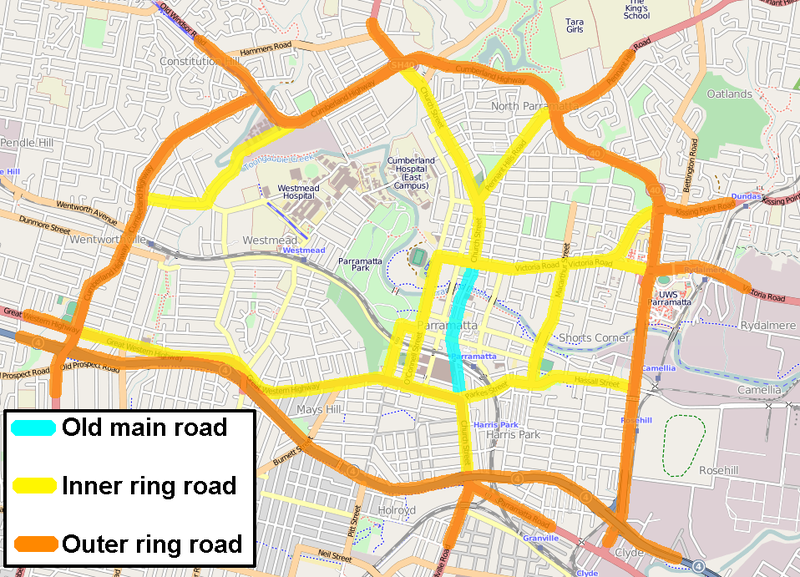 This has meant that the existing paths have not been able to be linked up, improving connectivity for bike riders going from one part of the CBD to another. Doing this with a new bike path along George St would achieve this. But in light of past experience, this may well just be another stalling tactic by a government that is just not interested in promoting cycling. Transport Sydney racked up its 100,000th hit late last night (ironically while I was watching the transport episode of Shitsville Express on ABC2). A big thank you to all those who have visited, liked, shared, and commented on this blog during the last almost 2 years. 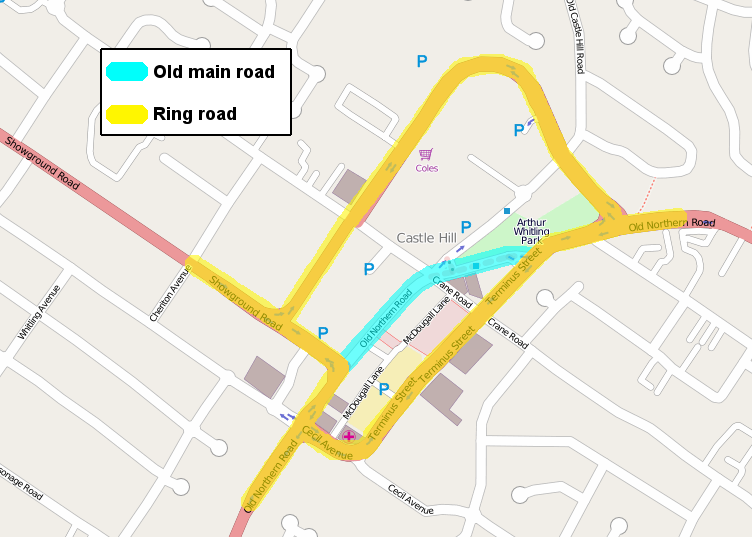 That includes those who did so by voicing dissenting views to those aired here – we may not always agree on the specifics, but its great to see people passionate and interested about the important issue of transport infrastructure! I must admit that it is humbling to see that something which started out as a way for me to express some views of interest for my own purposes has grown into something which is read so widely. I’d also like to apologise for the lack of content recently. I began a new job last week and this has eaten up much of my spare time. I will try to continue to do about one post per week, though posts on recently occurring events/news may be somewhat delayed until I have time to gather my thoughts and turn them into something in writing. In other news, today is also my 30th birthday. Wishes of a happy birthday in the comments section (purely for my own ego) are welcome! The Australian economy is at a crossroads. The mining boom is starting to fade, and this provides a great opportunity for a new boom in housing construction to take its place. But to do this, governments need to follow up with an infrastructure boom. This is why. First, the mining boom is not over. Metals prices will remain high for many years to come, and Australia will benefit from exporting its resources. Nor is the mining investment boom, the expansion of the industry through the construction of new mines, over. 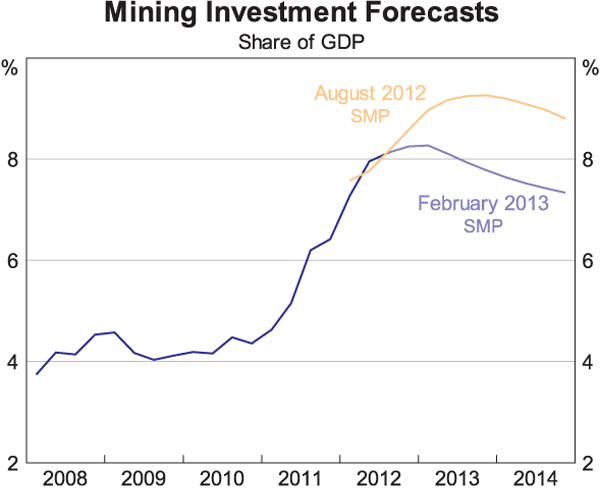 But mining investment has peaked (see graph below). And it has peaked in 2013, earlier than the 2014 date it was previously expected to peak at. The mining investment boom is difficult to understate. 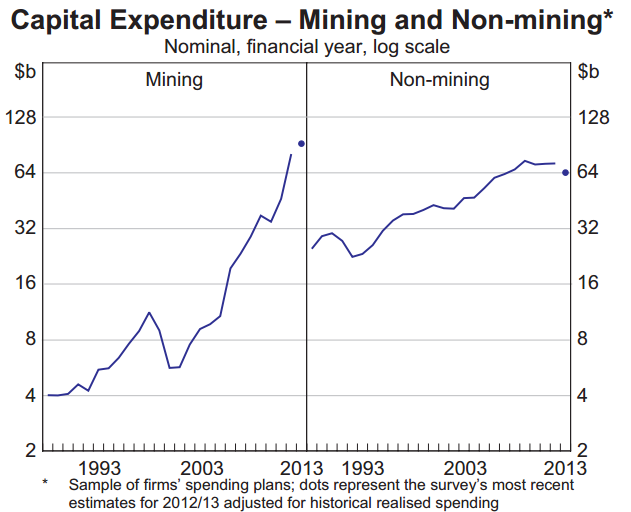 Capital expenditure on mining in 2013 is about 10 times what it was a decade ago in 2003, and now comprises more than half of all investment in Australia. Meanwhile, all other investment in 2013 is less than twice its levels in 2003. It is this investment boom that has led to such strong economic growth, and which has employed so many Australian workers. Actual mining itself today employs only 2.3% of the Australian workforce (despite mining generating about 10% of national income), and this level of employment is after it more than tripled in the last decade. But many more Australians have been employed during the investment phase: engineers, construction workers, tradies, etc. 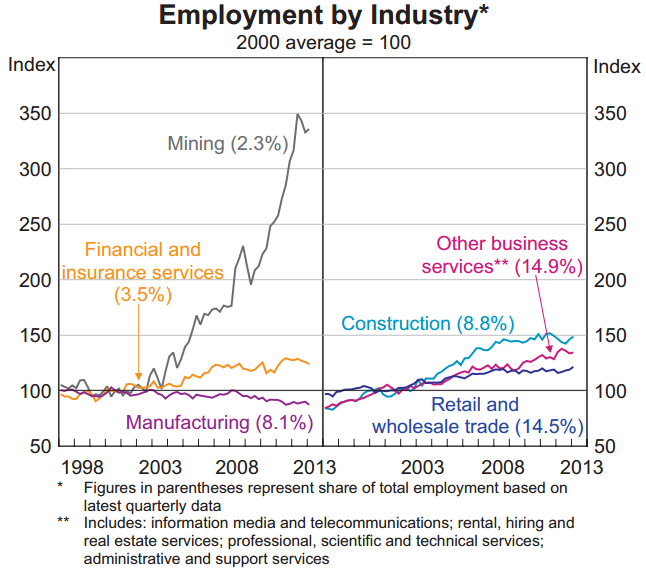 As a result, both “construction” and “other business services” (which combined now account for almost a quarter of Australia’s workers) have seen the strongest proportional increase in jobs outside of the mining industry. A post-mining investment boom peak Australian economy therefore has to answer 2 questions. First, where is increased demand going to come from to pick up the slack from falling mining investment? Second, where are all of the workers employed during the mining boom going to work now that the mining investment boom is winding down? The obvious answer, it would seem, is housing construction. 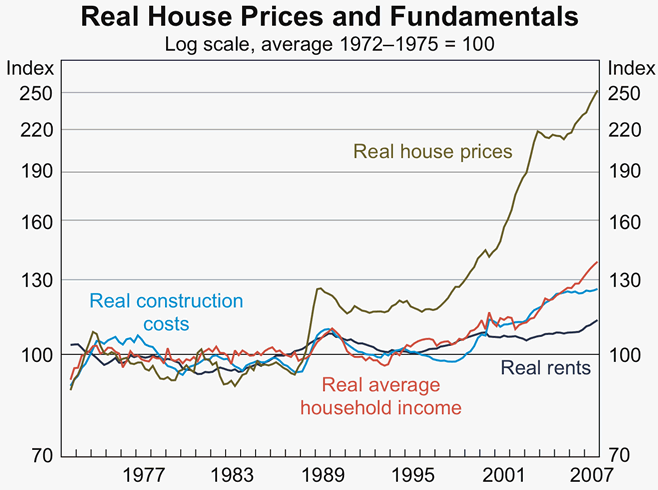 Australia’s supply of housing stock has failed to keep up with demand since the mid 1990s. 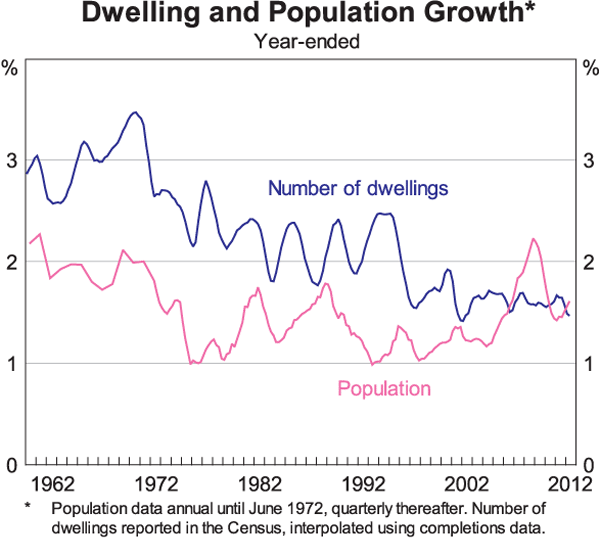 Up until that point, the rate of growth in number of dwellings was about one percentage point above the rate of growth in the population. (This has been because the number of households grows faster than the size of the total population – families tend to be smaller, meaning more households for a given level of population, while single occupant households continue to grow in popularity.) However, in the mid 90s the spread between these two growth rates disappeared, and during the second half of the 2000s the population was growing at a faster rate than the growth in new dwellings. The convergence of these two growth rates could be due to average household sizes stabilising. For example, many young people are choosing to stay living with their parents longer, leading to less demand for single occupancy households. This would be demand driven – less demand for more housing, so less is built. But the reality is that housing prices have grown strongly since the mid 1990s, which suggests that it is actually supply driven – insufficient new housing leading to higher prices and thus people choosing to live in larger households to spread the cost of higher housing costs. In other words, the stabilisation in household sizes is a result of insufficient housing supply, rather than the cause of insufficient housing demand. Housing construction would simultaneously provide the required demand for investment that the mining industry currently provides, while also providing employment to those with the same skills that the mining investment boom currently employs. But for this to work, governments everywhere must provide the necessary infrastructure to cope. That means, among other things, more roads and more rail. And, given the lack of funding available to state governments, this also means the federal government needs to provide assistance in the form of funding. And not just for roads, like Opposition Leader Tony Abbott wants, it needs to be for urban commuter rail too.